There are a lot of pie charts, numerical tables and graphs on display this week at the American Society of Human Genetics in San Francisco, but one caught our eye Wednesday morning. It was a graph put up by Dr. Cinnamon Bloss of the Scripps Translational Science Institute. Scripps has been studying consumer reactions to genetic testing for a couple of years now. 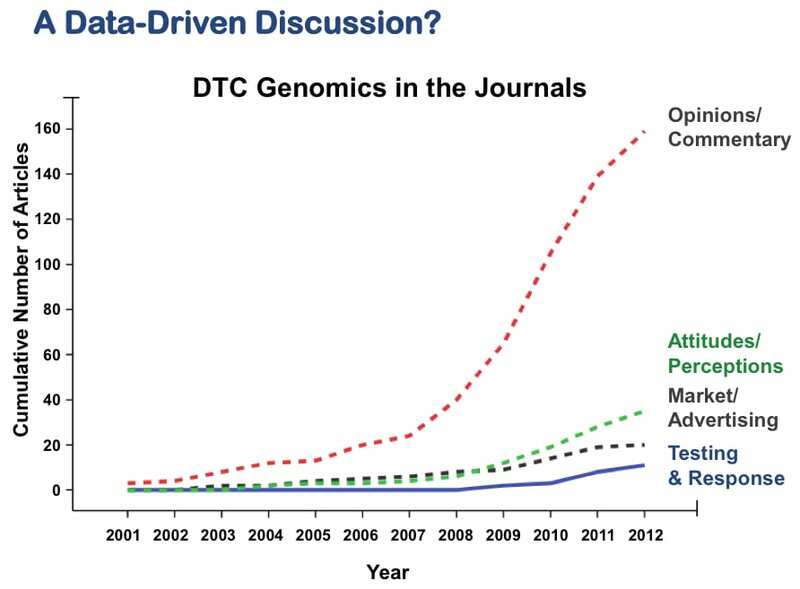 The graph tracks the coverage of direct-to-consumer genetic testing in academic journals over the last ten years. What’s interesting is how widely divergent the lines are between the number of opinion pieces and actual studies. While the number of studies into direct-to-consumer genetic testing ticked up modestly, the number of opinion pieces increased exponentially in that time. Bloss and her team broke down the arguments made in those pieces – both pro and con – and concluded that these are all opinions that they could study and gather evidence on. Do these tests induce anxiety, for instance? Or do people understand the information they get from these tests? Do they take action on what they learn or talk to their doctors? We’ve written a little about some of the work Bloss and her team have already done. She covered some of that territory again, showing that, for instance, several studies indicate that direct to consumer genetics testing does not induce high levels of anxiety among people who take have these tests done. It was interesting to learn that not only are people not worried about exploring their own genetics, they have a genuine desire to have access to that information. A study done by Dr. David Kaufman of Johns Hopkins University, who was also on the panel, showed that people reacted to getting this information by talking to their doctors or simply seeking out more information about conditions. Dr. Sandra Soo-Jin Lee of Stanford presented data from her study looking at social networking and genetic testing, where she found a high percentage of people openly sharing their genetic information not just with their doctors, but with family and friends. 23andMe has helped some of these researchers connect with our customers. During the panel discussion, Joanna explained 23andMe’s rationale for working with academics. There are a lot of reasons, but one of the main motivations is to learn more about what kinds of information customers respond to and what they find most useful. This helps us improve what we do.